The printable circuit process works much like an inkjet printer, but the ink is nanoparticle-based. 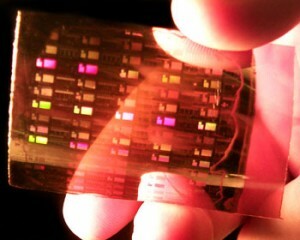 This is made by suspending nano-sized semiconductor particles in liquid. These flexible ink-like circuits are applied to plastic substrates in specific patterns to create printed microchips based on a custom design. In the future, this could be as simple as downloading a design of a microchip from the Web and printing a functioning microchip with a desktop fabrication machine. Another technique calls for a carbon-based chemical to be added to the specialized ink which can change the properties of the material being printed on. This expands the variety of substrates that can be used and allows for more versatility in material selection. Universities around the world, such as MIT and Cambridge, have made leaps and bounds in this research and development. In fact, certain components have already been printed and tested, such as thermal actuators, linear-drive motors and Microelectromechanical systems (MEMS), which are important components for a variety of electronics. For instance, MEMS are commonly found in pacemakers. The ability to print computer components and circuits at home with a desktop fabrication machine could be right around the corner. This technology is developing at a fast rate and major companies are trying to find ways to make it more affordable so it is marketable for personal use. Soon, we could become the creators of our own small computing systems.